When it comes to pictures, we'd rather be behind the camera than in front of it, so if taking unflattering facial close ups is your thing, FujiFilm's new Z5fd should be on your hot list. The 6-megapixel camera, which will come in red, silver, and UPS brown, packs all the usual goodness found in other Fuji cams (2.5-inch LCD, 3x optical zoom), but will also track and recognize faces, making it easier to embarrass your subjects with countless mug shots. 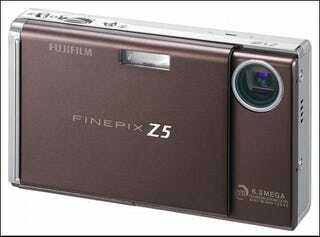 Like all FujiFilm cams it'll save images onto xD cards and it'll come with 26MB of internal memory. No word on U.S. availability or pricing so we recommend holding on to your PowerShot in the meantime.